A thought-provoking musical play that tells the Advent story with humor, poignancy and joy. 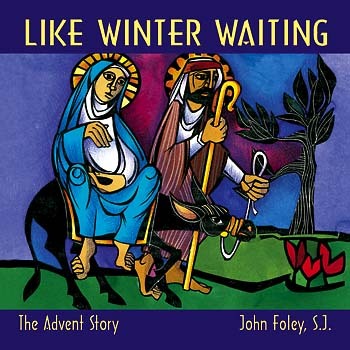 This 24-song MP3 album by John Foley, S.J. features a musical play telling the Advent story. The songs can be presented as a choral concert or a complete musical. Like Winter Waiting is a thought-provoking musical play that tells the Advent story with humor, poignancy and joy. It celebrates the anticipation of Christmas the way an expectant mother joyously awaits the birth of her child -- the waiting is a sacred time of reflection, preparation and hope. Like Winter Waiting is a thought-provoking musical play that tells the Advent story with humor, poignancy and joy. It celebrates the anticipation of Christmas the way an expectant mother joyously awaits the birth of her child—the waiting is a sacred time of reflection, preparation and hope. The play can be presented as a choral concert with some spoken parts or as a complete musical play with characters, costumes, a minimal set and even dance. The SATB choral arrangements are accessible to most parishes and can be conveniently rehearsed using the CD with voice lead-ins. The audience can participate by singing the recurring theme song printed in the assembly edition, and the instrumental manuscript contains parts for flute, violin, oboe, horn in F, bass, timpani and percussion. Perfect for multigenerational groups, Like Winter Waiting can make a great addition to your parish’s Advent season.